Its highly recommended that you pre- register to assure there is a division for you. Special Round Lengths for The IKF World Classic in Orlando, Florida. 2-Two Minute Rounds with a 1 round Tie Breaker if needed! Be Ready! Be In Shape! Fighter Registration ENDS At 2:PM Saturday, August 3rd, 2019. GENERAL IKF/PKB Rules - World Classic Bout Lengths Above. If there is a small division or advanced divisions, IKF/PKB Representative, promoter, trainer and fighter may all agree to increase length of a round or rounds. See Additional Round information below. Standard Boxing rules apply in all divisions. Dress Code: Full Length, Long Karate or Contact Pants are MANDATORY. Dress Code: Shorts are Mandatory, NO LONG PANTS. Knee strikes to the body allowed - No Elbows. Dress Code: "MUAY THAI" Shorts are Mandatory, NO LONG PANTS. There are no Knockouts and, or Technical Knockouts. If a fighter quits, (for example due to exhaustion) this will give a win to his or her opponent by DEFAULT. HAND & FOOT STRIKES to the HEAD - Semi- Contact Only - The Official IKF/PKB Ring Referee or the IKF/PKB Ringside Representative, may penalized by points or disqualify the striker. Any Knockout will result in Disqualification of the striker. *There are some exceptions to a person stopping or faking a knockout. 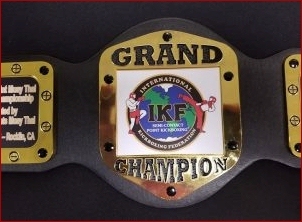 This circumstance shall be determined by the Official IKF/PKB Ring Referee or the IKF/PKB Ringside Representative. Together, they will determine the reason for the stoppage and designate the winner. Full Face Headgear with Jaw Bars or even Full Faceguards are allowed if a fighter wants to wear one. Foot Pads - Above the waist Full Contact Rules Only! All fighters wear IKF/PKB APPROVED boxing gloves. GLOVES: **10 or 16 ounce Boxing Gloves. Weight, Age and Experience shall determine glove SIZE. 16 ounce for ADULT Divisions. (**) 10oz may be use for ages 4-8 year old. Hand Wraps: Standard hand-wraps should be worn by all competitors. Breast and Chest Protectors are optional for adults but are recommended. If one fighter chooses not to wear a protector, it will have no bearing on the scoring. The winner will still be determined by who hits the point areas most effectively. Point Kickboxing / Muay Thai is a semi contact event and no full contact techniques will be allowed. Foot pads if Full Contact Rules. All strikes must be in designated striking areas... these are front head area, front body area, inside and outside of thigh... no groin strikes. If there is a draw in a match there will be an extra round to determine a winner. If a knee is thrown to the body but is blocked it is not a point. All techniques must land in designated striking area to be counted as a point. Heavyweight: 175.1 - & up. Yes. In some cases there can be dual round eliminations. However, at this time we only do single round elimination because most competitors at this level or not conditioned enough to complete the division. A promoter must advertise in advance if the they have approval from the IKF/PKB to have dual round eliminations. Do the fights take place in a Boxing Ring or MMA Cage? NO! IKF/PKB is ONLY done on an OPEN FLOOR with NO PHYSICAL barriers such as a wall or table as a boundary. Only Semi Contact is allowed. ( HEAD OR BODY ) and contact is strictly enforced! You will feel the intensity of the fight! Headgear with faceguards are not mandatory but can be worn by any fighter, regardless of what their opponent wears. Regular Kickboxing Rules (High Kick/Above Waist) all must wear Long Pants. International Rule/ Muay Thai Rules (Kicks allowed to the legs) competitors must wear Shorts. Can we knee to the head in the Muay Thai bouts and use elbows? In the International Rule bouts there are no knees allowed. Knees are allowed in the Muay Thai Divisions. NO ELBOWS are allowed in ANY Division on IKF/PKB. However, Headgear with faceguards or even Jaw Bars can be worn by any fighter, regardless of what their opponent wears. Headgear with faceguards or even Jaw Bars can be worn by any fighter, regardless of what their opponent wears. Each fight is 1 Round comprising of 2 Minutes. Grand Championship bouts may go two rounds but must be approved in advance of the bout. The bout will be judged at the end of each round or at the end of the second round. Bout lengths and round lengths can be determined by the IKF/PKB Rep., Promoter, coaches and fighters in advance of if an adjustment is needed.